Soroptimist International is a worldwide volunteer service organization for business and professional women, working to improve the lives of women and girls in local communities and throughout the world. Almost 95,000 Soroptimists in about 120 countries and territories contribute time and financial support to community-based and international projects that benefit women and girls. SI Vista and North County Inland was chartered on March 23, 1953 and has approximately 40 active members. We are part of the Desert Coast Region, Soroptimist International of the Americas. Thank you for considering a gift for Soroptimist International of Vista and North County Inland and for its mission of improving the lives of women and girls. We appreciate your support and pledge that your total contribution goes to our community service fund, which supports women and children's programs in the community. For members: Now you can pay your dues online! We meet at noon on the 1st Fridays of each month except July and August. Our Program meetings are held on the third Friday of the month at the Shadowridge Country Club in Vista. Please check our Calendar page for details. 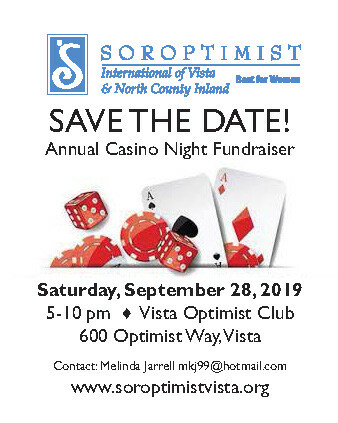 September 28 - Casino Night at the Vista Optimist Club, 600 Optimist Way, Vista, 5-10 pm. Prizes! Save the date. Every year, Soroptimist International of Vista, San Marcos and Escondido gives education grants to women who have faced extraordinary hardships, yet are determined to pursue and achieve their educational and professional goals. Our program, called Live Your Dream, was established to help women obtain the skills, training and education necessary to improve their employment status and standard of living for themselves and their families. Awards are given to motivated women who are the primary financial supporters of their families and seek to improve their lives by gaining additional skills, training or education. Many of our previous awardees are single mothers pursuing degrees at local colleges and universities.These cash awards are unique in that they are meant to offset costs associated with the recipient?s efforts to attain higher education including tuition, books, supplies, child care or transportation costs. Please help us make these women's dreams a reality by donating to this unique program! Thanks to all who attended the Human Trafficking Awareness walk on January 12! Casino Night, "A Night at the Museum", 2018 A Big Winner! Keep checking back for more information about next year's casino night event. Thanks to our table sponsors: Cosmic Solar, Vista Rotary, Paul V.L. Campo, Assly Sayyar, and Paul Eckert. 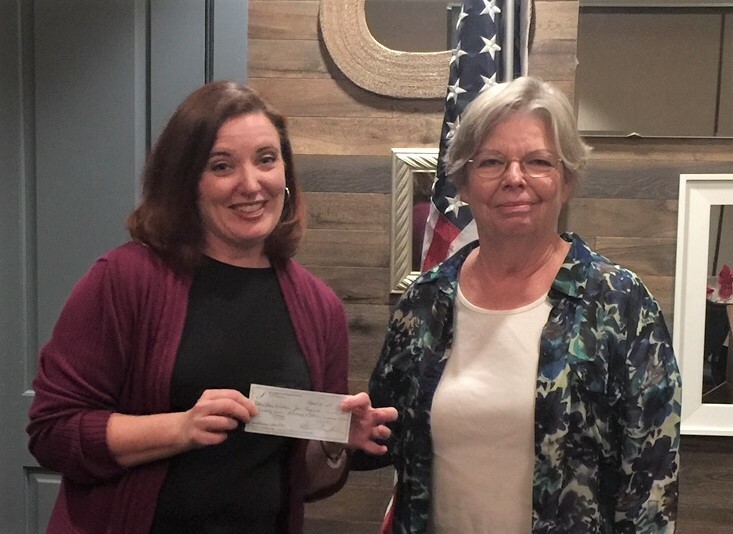 Susan Johnson (left) from Alabaster Jar Project receives $2,500 to assist in their mission of empowering survivors of human trafficking. Kaye Van Nevel (right) is Chair of the Human Trafficking Awareness committee for SIVNCI. Last Year's Live Your Dream Awards Gala, was a smashing success! Three deserving women were awarded $5,000 each to help them continue their education. Additionally, each were given a laptop and printer. Thanks to all who attended and a special thanks to our sponsors: Tri-City Medical Center and Modern Builders Supply. Also, a special thanks to the employees of Datron World Communications for their generous donation. Sheryl Roush, CEO, Sparkle Presentations, Inc., Accredited Speaker, Author & Coach donated her services and presented a wonderfully inspirational message. Now you can donate to Soroptimist of Vista when you shop on Amazon. Just use the following button and Amazon will donate a portion of the total of your order to us! And you can use your SCRIP cards, too! Ask a member about SCRIP. Please click here to visit our special section about this important issue. For news about our fight against human trafficking and other information, visit our BLOG.